Michigan and Florida open their seasons against each other on Saturday. 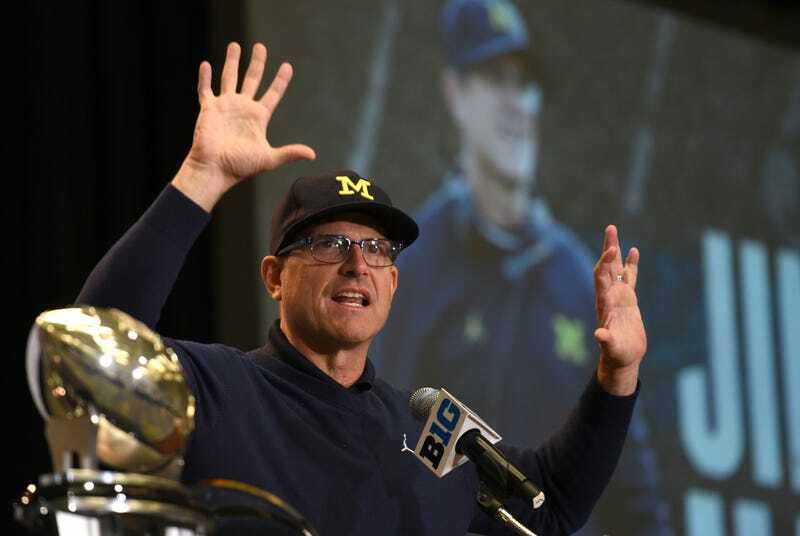 As of today, nobody knows who will be starting at quarterback for either team, and nobody is really quite sure who is even on Michigan’s roster. This is because Michigan head coach Jim Harbaugh and Florida head coach Jim McElwain are being petty as hell. There’s been ongoing confusion about who is on Harbaugh’s 2017 squad, because the team has yet to update its official roster from the 2016 version. Meanwhile, McElwain is refusing to tell anyone who his starting quarterback will be, and last week nobody was quite sure why this was all going on. Based on comments both coaches made today, they are being stingy with information simply to rile each other up. The only bad thing about this tiff is that it is destined to end as soon as Michigan and Florida take the field on Saturday. Unless one of these guys has the guts to send his team out of the tunnel decked out in blank jerseys and tinted visors. This is their chance to prove who cares the most about being a football dickhead.